ROSELAND, NJ -- (MARKET WIRE) -- August 30, 2006 --Private sector employment increased by 107,000 in August, according to today's ADP National Employment Report(SM). The ADP National Employment Report, created by ADP® Employer Services in partnership with Macroeconomic Advisers, LLC, is based on actual payroll data and measures the change in total nonfarm private employment each month. "We are pleased the ADP National Employment Report has established itself as a valued data point," said Gary Butler, President and Chief Operating Officer, CEO-elect of Automatic Data Processing, Inc. "The ADP Report has become an important resource that should be considered when assessing the national employment situation." "Total nonfarm private employment grew 107,000 from July to August on a seasonally adjusted basis, according to the ADP National Employment Report," said Joel Prakken, Chairman of Macroeconomic Advisers, LLC. "These findings indicate that establishment employment continued to grow sluggishly in August." To obtain additional information about the ADP National Employment Report, access the full schedule of future release dates, and subscribe to monthly e-mail alerts and RSS feeds, please visit www.ADPemploymentreport.com. 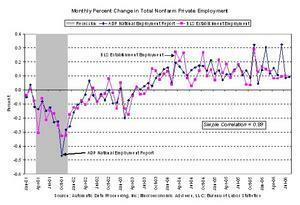 The September 2006 ADP National Employment Report will be released on Wednesday, October 4, 2006 at 8:15 a.m. EDT. Automatic Data Processing, Inc. (NYSE: ADP), with nearly $9 billion in revenues and more than 570,000 clients worldwide, is one of the largest providers of a broad range of premier, mission-critical, cost-effective transaction processing and information-based business solutions. ADP® Employer Services (ES), a division of ADP, offers the widest range of HR, payroll, and benefits administration solutions from a single source, to meet the extensive business needs of employers worldwide. Built with more than 50 years of industry experience, ADP ES' cost-effective, easy-to-use solutions provide superior value to companies of all sizes. Approximately 540,000 companies rely on ADP ES for unparalleled service and compliance expertise, allowing them to focus on other core activities. For more information about ADP ES or to contact a local ADP sales office, reach us at 1.800.225.5237 or visit the company's Web site at www.ADP.com.